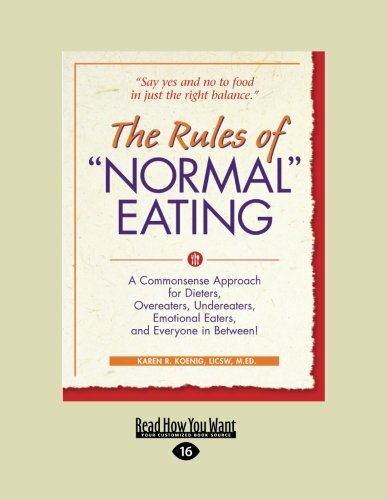 Karen R. Koenig The Rules of "Normal" Eating: A Commonsense Approach for Dieters, Overeaters, Undereaters, Emotional Eaters, and Everyone in Between! Written in easy-to-understand, everyday language, The Rules of "Normal" Eating lays out the four basic rules that "normal" eaters follow instinctively — eating when they're hungry, choosing foods that satisfy them, eating with awareness and enjoyment, and stopping when they're full or satisfied. Along with specific skills and techniques that help promote change, the book presents a proven cognitive-behavioral model of transformation that targets beliefs, feelings, and behaviors about food and eating and points the way toward genuine physical and emotional fulfillment. Readers learn how to reprogram their dysfunctional beliefs, manage uncomfortable feelings without turning to food, and establish new eating habits that tune their bodies into natural sensations of hunger, pleasure, satisfaction, and satiation. Filled with humorous insights, compassion, and practical wisdom, the book outlines balanced attitudes and patterns that benefit all types of eaters. Psychotherapist and educator, former chronic dieter and world-class binger, Karen Koenig, LicSW, M.Ed. transformed herself from overweight and unhappy to fulfilled and weight-comfortable by learning to become a "normal" eater. She is a clinical social worker in private practice with more than 20 years' experience helping hundreds of compulsive, emotional, and restrictive eaters learn to eat normally. A skilled and dynamic teacher, Ms. Koenig runs graduate social work and psychology continuing education programs in eating and weight management, where she teaches her "normal eating" model. She is a founding member of the Greater Boston Committee of the Massachusetts Eating Disorders Association, and is an active member of the National Association of Social Workers, Massachusetts Chapter Private Practice Committee. As a frequent contributor to Focus, NASW's state publication, Ms. Koenig has written columns on eating, weight, and body image problems. Her personal essays have been published in The Boston Globe, The Boston Herald, and other local and national publications. She was a semifinalist in the 1999 Massachusetts Film Office Screenwriting Contest and received a Certificate of Achievement in the 1996 Writer's Digest Literary Short Story Contest. Over the past three decades, she has been interviewed on radio, television, and in print and served as spokeswoman for groups such as 9 to 5, Organization of Women Office Workers, the FACE Program, and the Self-Esteem Boston Educational Institute. 2. The Rules of "Normal" Eating: A Commonsense Approach for Dieters, Overeaters, Undereaters, Emotional Eaters, and Everyone in Between! 3. The Rules of "Normal" Eating: A Commonsense Approach for Dieters, Overeaters, Undereaters, Emotional Eaters, and Everyone in Between! 6. The Rules of "Normal" Eating: A Commonsense Approach for Dieters, Overeaters, Undereaters, Emotional Eaters, and Everyone in Between! (Paperback)"
9. The Rules of "Normal" Eating: A Commonsense Approach for Dieters, Overeaters, Undereaters, Emotional Eaters, and Everyone in Between! 10. 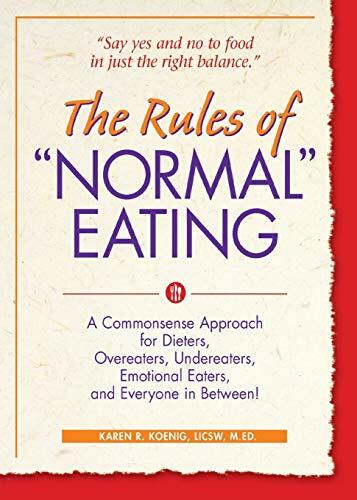 The Rules of "Normal" Eating: A Commonsense Approach for Dieters, Overeaters, Undereaters, Emotional Eaters, and Everyone in Between!